Buyers are awash with information, bombarded with sales and marketing messages, crazy busy, and tasked to do more with less. Yet they still want to hear from sellers, and they still accept meetings with sellers who reach out to them proactively. 82% of buyers will accept meetings with sellers who reach out. The sellers who secure these meetings achieve significantly greater success with a much different approach. 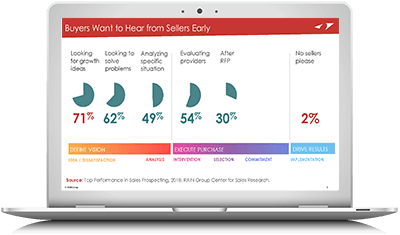 In this webinar, Mike Schultz, President of RAIN Group, Director of the RAIN Group Center for Sales Research, and bestselling author of Insight Selling, shares new data from 489 sellers and 488 business buyers. He'll reveal exactly how sellers secure meetings and how buyers prefer to be contacted. Top Performers generate 2.7x more conversions with target contacts than The Rest. In this webinar, you'll learn exactly how they do it. If you need to fill your pipeline with qualified leads, this webinar is a must-watch. To access the on-demand webinar, simply fill out the form to the right.